One of the best friends to bicycling in the Tampa Bay area is Tom Singletary, a gentleman lawyer from Tampa who is a member of SWFBUD. Let's send out fast recovery wishes to Tom, who crashed in the Strawberry Ride on Sunday and broke his collarbone and left his ribs feeling mighty sore. It was about a year ago when I met a willowly bicycle rider/folk singer by the name of Rachel VanSlyke in Dundee off US 27. She was biking 4,000 miles from Miami to Montreal and singing at places along the way. I am happy to report that Rachel completed her bike ride and met a ton of terrific people along the way. We swapped emails recently and I have good news -- Rachel will attending the 2009 Bicycle Bash by the Bay to perform. Rachel is a singing bicycle advocate and her story can be found here. You have to check out the moves by this bicyclist. By the way, he's blind. Do I have a treat for you mountain bike fans. Check out this terrific trailer about the 2009 Cycling Film of the Year as awarded by the Endurance Sports Awards. This afternoon Bicycle Stories visited the Renaissance Festival on the MOSI property across from USF. I was allowed to lock the bike right next to the entrance. Basically, it's a Medieval Times Halloween. There was a ton of live entertainment a la the Strawberry Festival and tons of renaissance faire vendor booths peddling medivela clothes, jewelry and refreshments. An amazing number of people come dressed for the occasion, much like baseball and football fans wearing team jerseys. People brought some unusual pets. Wenches had their unions back then, too. The happy couple -- Peter Pan and Tinkerbell. Dirty Nellie has some funny verbal cracks. The art work was very nice. What, no sword? The human chess game included this fella who wielded the always-dangerous rolling pin. The entertaining wenches were everywhere on stage. Now we know how Jim Norman spends his weekends. Even the kiddies enjoyed the garb. Raccoon tails are very popular in Ren-Land. They still are in Hillsborough County. This pair of wenches had a good ol' time yucking it up about washing clothes. AUSTIN, Texas -- Three days after surgery to fix his broken right collarbone, Lance Armstrong posted a photo of himself back on his bike training on his Twitter feed on Saturday. "Got on the spin bike for half an hour today," the seven-time Tour de France champion wrote. The 37-year-old American cyclist was expected to resume training almost immediately to meet his goal of racing in the Giro d'Italia, which begins on May 9. He also plans to ride in the Tour this July, his first since 2005. Surgeon Doug Elenz inserted a stainless steel plate and 12 screws to stabilize the broken collarbone on Wednesday, two days after Armstrong crashed in the first stage of the Vuelta of Castilla and Leon in northern Spain. 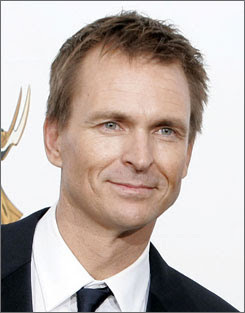 More TV bicycling -- The Amazing Race host Phil Keoghan is cycling cross-country to spotlight the battle against multiple sclerosis. He was on the Bonnie Hunt Show this morning and stories have run in USA Today and MSNBC. This week, Karen Kress and I met with the executive director and communications director of the Tampa-Hillsborough Expressway Authority regarding Sunday morning bicycling on the top deck of the Selmon Expressway. The Highway Authority estimated it would cost $133,270 to allow bicycling -- most of it was $111,600 for temporary 4-foot, six-inch fencing. The cost, in effect, prompted the expressway board to say no to bicycling. But I was given the opportunity to come up with our own fence-barrier estimates. If you know any barricade or fence company that loves bicycling and would love to see cycling on the upper deck of the Expressway, please let me know. Ellen DeGeneres gave Jennifer Hudson an interesting gift. Check out the present. On the way to St. Petersburg in the spacious shoulder on the Gandy Bridge. I got an email from someone who said she was stopped by a police officer from biking across the Gandy Bridge recently. Has anyone else who has biked on the Gandy Bridge been confronted by an officer who told them they were disallowed from biking across the bridge? You're looking at a violation -- yeah, right. The security guard at Publix in downtown St. Pete insisted it was against state law to park an unattended bicycle inside Publix. He said the law was passed because people would trip over a parked bike and sue Publix and the bike owner. Wow, who knew? I met this guy by the USF campus in downtown St. Pete. He loves his bike. Biking the car race circuit in downtown St. Pete. Standing silent. The old Al Lang stadium - former spring home of the Rays, Mets, Cardinals and a few other teams. Not much happening there this month. These tires would be handy for a crit, too. This morning I had the opportunity to attend a city staff transportation meeting regarding a proposal by the Tampa Downtown Partnership to stripe bike lanes on Cass and Tyler streets as part of the UCAP utility work along those two streets. I was invited by Karen Kress of the Tampa Downtown Partnership to the meeting and I want to go on record that on behalf of SWFBUD (South West Florida Bicycle United Dealers), I strongly support this bike lane idea that was outlined by Ms. Kress and Tampa Downtown Partnership consultant Michael Moule. It makes perfect sense. The roads are on the city's bike lane plan and the UCAP project offers the perfect opportunity to stripe bike lanes during the road work following the utility work. It also is consistent with the mayor's goal of making Tampa a green city and Mr. Lee's efforts to stripe bike lanes when new street work is done. In fact, SWFBUD encourages the city of Tampa to look at its UCAP map and stripe bike lanes on roads in the city that are re-paved as a result of the utility improvements. That would be consistent with the objectives outlined in the Bicycle Component of the city's Comprehensive Plan and make Tampa a safer place to ride bicycles. AUSTIN, Texas -- His broken collarbone surgically mended, Lance Armstrong is on the clock. The seven-time Tour de France champion will be back on his bike in days even though the bone may take eight to 12 weeks to fully mend. Armstrong must resume training almost immediately if he's to meet his goal of racing in the Giro d'Italia, which begins May 9. The 37-year-old American cyclist also plans to ride in the Tour de France this July. Surgeon Doug Elenz inserted a stainless steel plate and 12 screws to stabilize the broken collarbone on Wednesday, two days after Armstrong crashed in the first stage of the Vuelta of Castilla and Leon race in northern Spain. "Lance is going to be a patient who is going to push the envelope," Elenz said. "This first week we're going to make Lance take it easy ... ask Lance not to do a whole lot." After taking a few days off, Armstrong will be allowed to ride a stationary bike. Then doctors will monitor his arm strength, range of motion in his shoulder, as well as his pain, to decide what kind of training he can do. Doctors don't want him to strain his upper body in any way for a while. Just hours after the surgery, Armstrong was posting to his Twitter feed, reassuring fans. "howdy folks. Made it thru. Took longer than we thought. Playing with my kids right. Making me feel A LOT better," he wrote. Although doctors initially thought it was a simple fracture, Elenz said X-rays showed it was broken in four pieces. The surgery took nearly three hours, which is almost twice as long as it would have lasted in the case of a "simple" break, Elenz said. Rating the surgery on a scale of one to 10, from easiest to most difficult, Elenz called Armstrong's procedure an 8. "This was a challenge," Elenz said. "It was a hard case." Elenz said the 12 screws were more than he might normally use, but he felt they were needed knowing Armstrong's goals. The surgery to stabilize the bone required about a 5-inch incision and the steel plate measures about the same length, said Elenz, who added it's likely doctors will someday remove the plate. Armstrong returned to elite cycling this year after a 3-year layoff. During a conference call Tuesday night, he said he was frustrated the injury came just as he was getting into top shape. He was among the top 10 riders for much of the race Monday before he crashed about 12 miles from the end of the stage. Now, he's determined to get back to the front. "I think the Giro is still very doable," Armstrong said. "This is definitely a setback, no doubt. It's the biggest setback I've ever had in my cycling career, so it's a new experience for me." "I’m shocked at the irony, and hope you are too. "Within weeks of the Florida Governor’s office proclaiming March as Bicycle Month and celebrating our trail victories, the Florida Department of Environmental Protection (FDEP) announced devastating cuts to the Office of Greenways and Trails (OGT), effectively eliminating this nationally renowned program. "Act now to protect Florida’s greenways and trails. "These cuts are excessive and disproportionate to FDEP’s other proposed cuts. While other FDEP program budgets are being cut 20 percent, this proposal would, among other things, eliminate more than 80 percent of OGT’s Tallahassee staff! In addition to rolling back the pro-trail clock 10 years, this measure risks nearly $50 million in hard-earned development money for Florida’s future trails. "RTC understands that cuts are required, and should be fairly distributed. However, the OGT program reduces our dependence on oil, improves health, betters our environment and strengthens our communities. Eliminating it does far more harm than good, and for generations to come. "Please speak up for trails now. P.S. Want another opportunity to advocate for bicycling? Join RTC and the Florida Bicycle Association at the Florida Bicycle Summit, April 2, 2009. Help begin a new era of bicycling and trails in Florida. We need you! Please register for this FREE event now." Bicyclists come in all types in Tampa. He wanted change to catch a bus. But in the end, he's the one who gave. "No problem, bro," he told me when I asked to get a snapshot of his bicycle. This portrait late this afternoon. Near Stephon Foster Elementary School off 22nd Street. This morning I biked to the downtown convention center in Tampa to hear Mayor Pam Iorio's state of the city speech. The only formal bike rack parking at the convention center was not under cover and my bike got soaked. 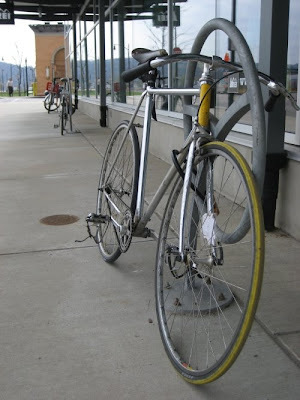 But the convention center has an empty area under cover that would be ideal for bike racks. 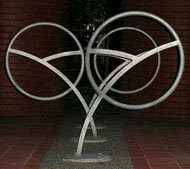 I sent John Moors, the convention center's boss, copies of these racks. They are in Pittsburgh. 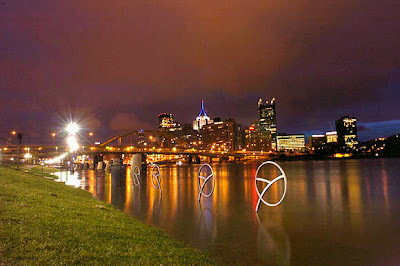 If Pittsburgh can have these bike racks then there's no reason why Tampa can't do it, too. BALTANAS, Spain -- Lance Armstrong was taken to a hospital Monday after crashing during the first stage of a five-day race in Spain. Armstrong fell in a pile-up about 12.5 miles from the stage's finish. The seven-time Tour de France champion, who is making a comeback to cycling and is riding with the Astana team in the Vuelta of Castilla and Leon race, may have injured his collarbone. Team spokesman Philippe Maertens said the American cyclist was taken to the hospital by ambulance, and race organizers said Armstrong was being treated at the Rio Carrion hospital in Palencia. I have seen my share of mayors as an ex-reporter covering city hall for papers around the country and there's few mayors as genuinely likable as our own Pam Iorio here in the city of Tampa. She biked with the Seminole Heights Bicycle Club's inaugural bike ride last year and she has a terrific old-time 'fro that reminds me of my own head of curly hair I sported in high school decades ago. Pam gave her state of the city speech this morning in a room that was too small at the Tampa Convention Center. To be truthful, the vast majority of attendees were city employees wondering if they would have a city job one year from now. Stuff about cutbacks and layoffs. You know the recession drill during these hard economic times. There was an upbeat 14-minute video showing city highlights like the Ikea groundbreaking and the 40th Street road project followed by Pam chatting for 25 minutes or so about how Tampa is the fourth most popular city in the country (gee, who knew?) and about how commited she is to mass transit/light rail. She was preaching to the choir and it was a pleasant lovefest of city employees and a few local movers and shakers. No mention of bicycling. And there was no Pam at the downtown Tampa crit and festival on Saturday. It would have been nice to see Pam on a bicycle pedaling on the VIP lap around the crit course and it would have been a super photo opp. City workers arrived to hear if they will have a job next year. I did meet my new best friend, Irv Lee, the city's public works chief, after the speech and I also met John Moors, the convention center's administrator. 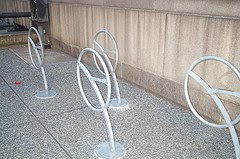 I lobbied Moors (no "e" by the way) to install a bike rack near the entrance off Channel Drive and he said he would check it out. Today was a good example about the variety of cycling I do. It began right here with this photo -- doing my base 46-mile roundtrip ride to Flatwoods and back. There is no one type of bicycling. There are many. You can race, you can tour, you can leisurely pedal your way along a home tour -- such as the Old Seminole Heights Home Tour on Sunday April 5 in two weeks. I represented the Seminole Heights Bicycle Club today and broke out the errand bike to liesurely bike the home tour with bike home tour master, Jim Shirk. It's a pleasant 5.5 miles mapped out by Jim and it promises to be a pleasant ride for anyone who chooses to visit the houses on the tour via bicycle. I will be stationed during the OSH Home Tour at Hillsborough High School, inflating tires and basically checking out bikes to make sure they're road worthy. Other SH Bike Club members will be there, too. So, come on down and do the home tour. Jim checks out an actual house on the tour. The homes will be a real treat to visit. Jim takes a short sidewalk to cut through to Hillsborough Avenue and continue the home tour. After the easy 5.5-mile Seminole Heights home tour route, it was off to the Fun Lan market to stock up on strawberries. There's only one way to transport strawberries -- and that's by rear bicycle rack, my friends. By the way, those strawberries weighed in at a whopping three bucks. But don't tell anyone. Wow, now there's a sight: bike racers in a downtown Tampa crit flying down Franklin Street. It was all part of the Twilight Crit that drew several hundred racers in a several different divisions today to bring attention to bicycling in the Tampa Bay area. The Tampa Downtown Partnership put on the crit and accompanying health festival to highlight Bike Month and the Tampa BayCycle program of getting people around Tampa on bicycles. See Tampa Tribune story on the crit. I was there representing the Seminole Heights Bicycle Club and SWFBUD and was happy to report that several SWFBUD members -- Brian Eckman, Thomas Singletary and David Luppino -- were on hand at the crit. I want to thank everyone who stopped by to say hi. Tampa has never been too receptive to closing downtown streets and allowing race organizers to stage a twilight crit, which is popular in places like Athens, Ga. But Karen Kress's efforts with the Tampa Downtown Partnership helped make today's crit become a reality. David Luppino, who used to own Carrollwood Bicycle Emporium and owned parts of Oliver's and Suncoast Trailside Bicycles shops, makes a point to Brian Eckman, who nows owns CBE. David is opening the Just Ride Bicycles store in Fish Hawk Ranch. They showed up on all types of bicycles. The famed Ghost Rider, Jack Sweeney, made a cameo on a mountain bike. Karen grew up in Sarasota but works in Scotland now as a yoga instructor but was in town visiting family in Sarasota. She came for the race. Racer Trish Cohen shows off her homemade jersey as seen on her www.oyvelo.com Web site. CBE's Brian Eckman did good business at the Carrollwood Bicycle Emporium store on site. SWFBUD member Tom Singletary, a Tampa lawyer and bicyclist, chats with Eric Pages -- a big pedestrian advocate who serves on the Bicycle-Ped Advisory Committee in Hillsborough County.